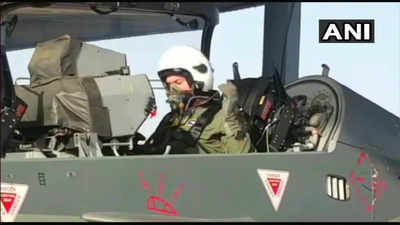 NEW DELHI: US Air Force Chief of Staff General David L Goldfein today flew the Indian Air Force‘s indigenous fighter aircraft Tejas from Air Force station in Jodhpur, Rajasthan. This is the first instance that the Light Combat Aircraft (LCA) was flown by a foreign military chief. Manufactured by the Hindustan Aeronautics Limited, the single-engine, mutli-role fighter jet was inducted into the Indian Air Force in July 2016. Goldfein is in India on an official visit and is accompanied by US Pacific Air Force Commander General Terrence O’Shaughnessy. The General met Air Chief Marshal B S Dhanoa on Friday and discussed ways to further enhance cooperation between the two forces.